Model for IRS-1 activity anti-inflammatory behavior. After IRS-1 loss, mutant KRAS recruits excessive p85 to membranes thus stimulating AKT and GSK3B phosphorylation. 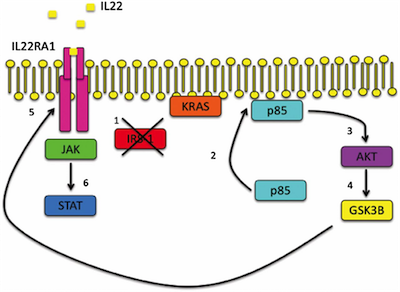 Phosphorylated GSK3B reduces IL-22 receptor (IL22RA1) ubiquitination and subsequent degredation resulting in hyperactive JAK/STAT signaling. The goal of a scientist is to remain unbiased and let each new result inform the next question and approach, yet there are many other forces at play. The richness of previous research, the availability of patient samples or research reagents, and the access to funding all inform and direct research questions. Great research arises from a detailed understanding of a mechanism or pathway, but occasionally one needs to search outside of the standard knowledge to make a big connection. Recently Dr. Metz and colleagues in the Houghton Lab (Clinical Research Division) made one such leap to understand the inflammatory nature of the tumor microenvironment in KRAS mutant lung adenocarcinoma. In their recent publication in PNAS, these researchers found that loss of insulin receptor substrate-1 (IRS-1) specifically in KRAS mutant tumors altered the types of immune cells recruited to the tumor microenvironment. Lung adenocarcinomas are commonly driven by two oncogenes in a largely overlapping signaling pathway: EGFR and KRAS. EGFR has been successfully targeted by small molecule therapeutics, while direct targeting of RAS remains an unmet challenge. In some cases targeting downstream effectors of RAS has proven successful; however, one such effector, IRS-1, has not been evaluated. To understand the role of this regulator, researchers grouped patient samples by their protein expression levels  IRS-1 high or low  and then evaluated patient survival. For all lung adenocarcinoma patients low expression of IRS-1 correlated with poorer survival and, interestingly when patients were further stratified by having an EGFR or KRAS mutation, survival and IRS-1 expression only correlated in patients with mutant KRAS. To characterize the link between IRS-1 and KRAS, researchers developed a transgenic mouse model that expressed mutant KRAS and a conditional deletion of the IRS-1 gene. When IRS-1 was deleted in the KRAS mutant mice, it resulted in more aggressive tumors and decreased survival compared to KRAS mutants without the deletion. While these findings were somewhat expected in light of the human tissue samples, an unexpected finding was an increased neutrophil population in the tumor microenvironment. IRS-1 null mice had five times as many inflammatory cells in their bronchoalveolar lavage fluid. Chronic inflammation is a well-known risk factor for cancer incidence and aggressiveness and was the likely culprit for the increased lethality of IRS-1 mutation combined with the KRAS mutation. Researchers depleted IRS-1 in KRAS wild type and mutant lung adenocarcinoma cells and then exposed them to a panel of pro-inflammatory cytokines. This showed IL-22 stimulated multiple chemokine response pathways only when IRS-1 depletion was paired with mutant KRAS. Moreover, this activity was specific to mutant KRAS and not mutant EGFR suggesting inflammation response accounted for IRS-1 association with mutant KRAS for patient survival. The question remained why only IRS-1 deficient, KRAS mutant cells responded to IL-22 stimulation. IL-22 stimulates an extracellular protein receptor, IL-22 receptor alpha 1. Thus this receptor had become more abundant or more active when IRS-1 is inhibited. By inhibiting new protein synthesis and tracking the membrane fraction of the IL-22 receptor, researchers found it was not degraded as rapidly in the IRS-1 deficient cells, thus becoming more abundant. Finally, researchers sought to connect these three players: KRAS, IRS-1, and IL-22 receptor. Working backwards from IL-22 receptor researchers studied a complex signaling pathway and arrived at the following model: KRAS stimulates PI3K signaling that IRS-1 can attenuate; if IRS-1 is ineffective GSK3B is hyperactivated and prevents IL-22 receptor degradation. Understanding this biology is important; however, Drs. Metz and Houghton realized their findings could have direct clinical relevance using current therapies. Cytokine stimulation such as by IL-22 is well known to activate the JAK/STAT pathway. Consistently, KRAS mutant, IRS-1 deficient cell lines activated STAT3 at much higher levels than KRAS mutant cells alone. Potent chemical JAK inhibitors have been approved for a number of diseases and are currently in trials for multiple neoplasms. Thus researchers evaluated the efficacy of these compounds in their transgenic lung adenocarcinoma model. Treatment with two different inhibitors decreased the tumor burden, but also reduced the inflammatory response in the IRS null tumors. Measuring inflammatory cells in the tumor microenvironment or direct activation by IL-22 revealed that JAK inhibitors reduced the tumor-promoting inflammatory signals. While a rich scientific knowledge exists of many cell signaling pathways, it is important to remember that the roles of many players are yet to be discovered. This work demonstrated a novel, protective role for IRS-1 in the context of cancer. Moreover, this new finding exploited our deep knowledge of cytokine pathways to suggest a clinically relevant, precision use for JAK inhibitors. It also emphasized the need to understand the tumor microenvironment and the value of moving between in vivo and in vitro models to ensure a full understanding of the biology. Funding for this research was provided by the Sidney Kimmel Foundation, the National Cancer Institute, and a Marie Curie Actions Fellowship.